I am a registered member of the BACP (British Association of Counselling and Psychotherapy) and abide by their rules and ethical framework. I also offer telephone and skype sessions which can be carried out, as long as you have a safe, secure and private room where you will not be disturbed. 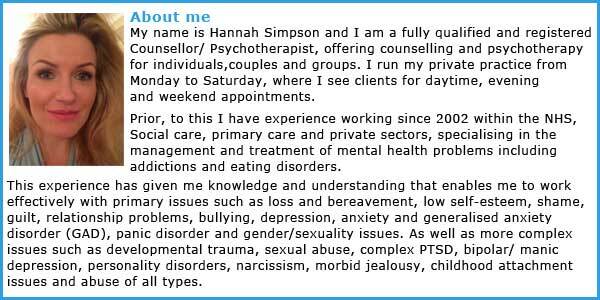 My standard fee is £75 per 50 minute session for individuals. 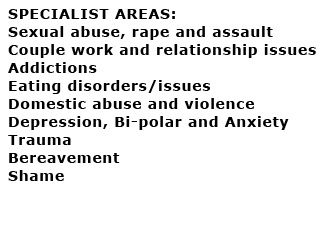 I can offer some reduced rate counselling and psychotherapy to those on low income and students, please enquire? £90 per 60 minute/ £105 per 75 minute session for couples and joint therapy. If you would like to enquire further please send me a message by e-mail h.l.simpson@hotmail.com or phone 07775 613133. I will usually get back to you by the next working day. I do prefer to talk directly with you before making a first appointment.